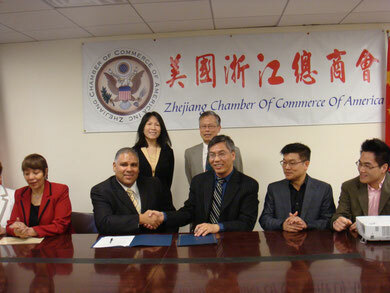 Zhejiang Chamber of Commerce of America and Hispanic Chamber of Commerce of Queens became the strategic partner on March 14, 2012. Thank you Manli Lin (SBA economic specialist) brought both Chambers together and help many small business in our community. “I wish our meeting will be the beginning of long-term corporation, the strategic partnership will ensure of creating better and broader business platform for Zhejiang business and Hispanic businesses. I believe it have a great impact on both chambers and will benefit all members”, said by Howard Dai, President of Zhejiang Chamber of Commerce of America. “Zhejiang Chamber of Commerce has a lot of business elites, wherever in China, US and all over the world, I hope this corporation will help the two chamber of commerce deeper in the future”, said by Thomas Chen, representative of council Peter Koo.